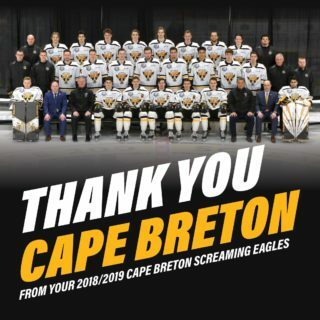 Four Cape Breton Screaming Eagles players- Kevin Mandolese, Egor Sokolov, Mathias Laferrière, and Adam McCormick- have been listed in the final ranking by Central Scouting ahead of the 2018 NHL Entry Draft in June. Central Scouting divides draft eligible players into four groups, dividing by players based in North America and Europe, and by separating goaltenders from goaltenders and defensemen. Mandolese is the second ranked goaltender among North American based players. This season the sophomore goaltender posted a record of 15-15 with a save percentage of .884 and a goals against average of 3.46. 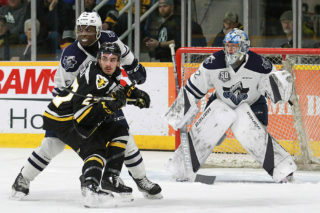 The 6’3, 180 pound Mandolese, who was chosen in the first round at pick #13 of the 2016 QMJHL entry draft by Cape Breton, also played in the Top Prospects game this past February. Sokolov is ranked 107th among North American based skaters. The 6’3, 222 pound Russian forward was selected by the Screaming Eagles with the 35th pick in the 2017 CHL import draft. As a QMJHL rookie this year Sokolov notched 42 points in 64 games and also scored in February’s Top Prospects Game. Laferrière has been ranked as the 130th North American based skater by Central Scouting. 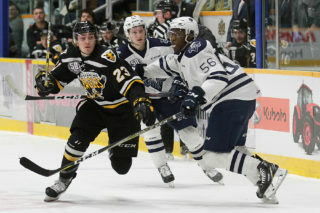 The Screaming Eagles forward notched 41 points in 67 games this season. 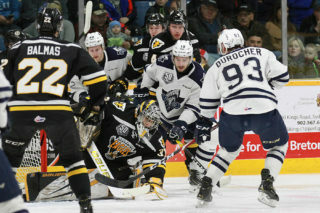 Standing 6’1, 175, Laferrière was chosen 7th overall in the first round of the 2016 draft by Blainville-Boisbriand and was acquired by Cape Breton in January of 2017. McCormick comes in with the 156th ranking of North American skaters. The second year blueliner registered 37 points in 67 games in 2017-18. The 5’11, 181 pound defenseman was chosen by the Screaming Eagles in the third round (49th overall) in the 2016 QMJHL draft. The 2018 NHL Entry Draft will take place on June 22nd & 23rd in Dallas, Texas.